See Edinburgh City of Literature in a whole new light: 1st -18th March. From Thursday 1st March, you’ll be able to see building sized projections inspired by the Scottish Enlightenment at historic locations across Edinburgh’s city centre. We commissioned new writing from six fantastic writers, which speaks to the location and the quotation being projected, a treat for your ears to match the visual feast for your eyes. You can tour the projections using our handy enLIGHTen trail; you can dip into the history and importance of the buildings we’ve chosen, with David Hicks from Edinburgh World Heritage as your guide; find out more about the quotations and why we’ve chosen them and explore the Enlightenment with our handy reading list. Or simply grab a coffee and enjoy the scene before you. 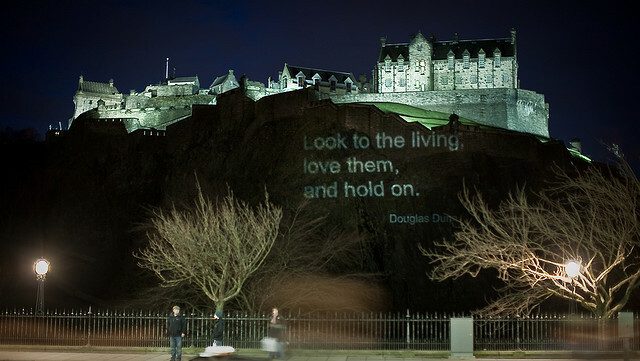 On Valentine’s Night in 2010, we projected some lines from Douglas Dunn’s poem ‘Disenchantments’ onto Edinburgh Castle, as part of our Carry a Poem campaign. The image and the message of those wonderful words – ‘Look to the living, love them, and hold on’ – travelled, via Facebook and Twitter, the media and by word of mouth, and plucked a chord with people around the world.